Head of Physics Department of Gordounstoun School Scotland. With an unrelenting spirit, Mr. Shomie Das has been a mentor, teacher, principal and the education consultant. His career began when he was appointed as the Physics teacher at the globally renowned Gordounstan School Scotland in 1958 after graduating from St. Xavier’s College Kolkata and Emmanuel College, Cambridge- where he was the inter-alia tutor to Prince Charles. Mr.Das is presently the Chairman of Oakridge International School in Hyderabad. Describing Mr. Das in limited words becomes challenging as he is the person behind the curtain who has been contributing his vision in education to nearly 76 schools. Giving educational consultancy, contributing to education foundations and several countries around the world Mr. Das has been counselling various school managements on ways and means on how to upgrade institutional infrastructure. 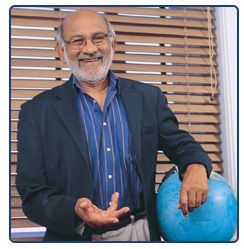 Serving on the governing boards of several schools, writing of textbooks and providing advisory & amp; consultancy services to philanthropic organisations, governments, school promoters and trustees in India as well as abroad, Mr. Das has been globetrotting his way to make a difference in the field of education around the world. Mr. Das has been proudly inducted into the Hall of Fame of Indian education, for his extra ordinary contributions and development of India’s top ranked legacy boarding schools and for upgrading school education system across the country.